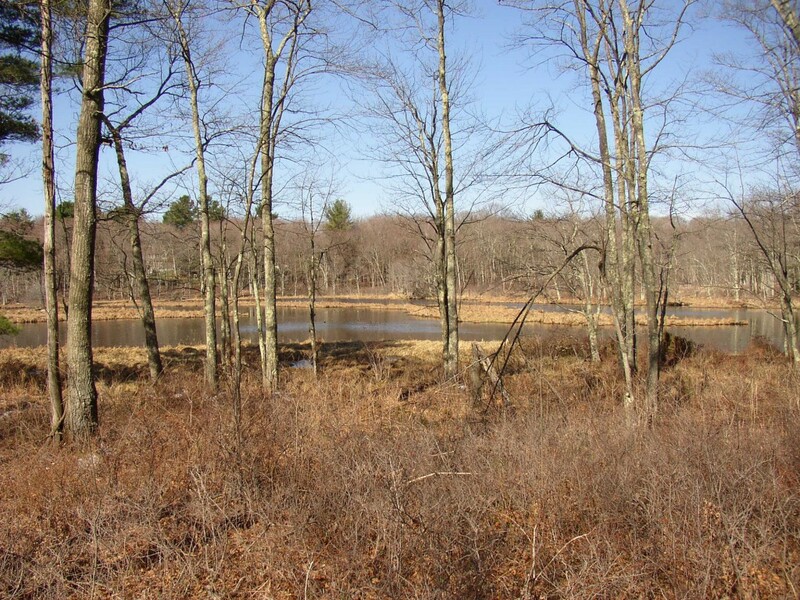 After a year of work, the Harwinton Land Trust completed a trail system through its Bull Pond property. The most difficult job, which involved building an 80-foot long boardwalk over a beaver dam, was completed in early September, 2014. The boardwalk now provides hikers with access to the preserve’s 50 wooded acres located north of Bull Pond. With additional crossings built over several small streams, hikers will find the new trails to be completely dry during normal weather conditions. 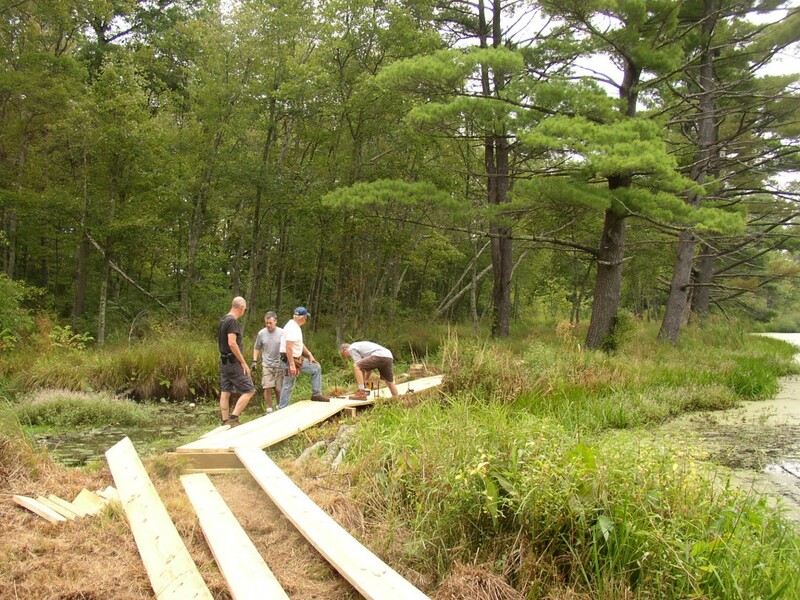 Land Trust volunteers install boardwalk. Land Trust volunteers show off their hard work! All trails are relatively flat and easy to walk, especially for young kids. Trails are also well-marked with plastic-colored blazers and should be easy to follow. You can print our map or view it on your phone or other device from this link. The trail is about 1-mile long starting from the wildlife observation deck on the shore of Bull Pond. Most people should be able to walk the entire trail system, observe the sights, and return in less than two hours. If you wish to have a shorter nature walk, the trail has four separate return loops that should reduce walking time to your liking. The shortest loop, which takes you to views of the entire pond, should take most people only about 30 minutes to walk. Beginning of 80-foot. long boardwalk. Leaving boardwalk to dry trail. Late-fall view of the upper end of Bull Pond from the short loop. With the area’s diverse habitats, nature watching should be excellent. Dusk is an excellent time to see beavers at work. The trails should also provide birders with good opportunities to view a variety of species within the preserve’s aquatic and wooded habitats. You’ll also want to see some of the oldest trees in town. Several oaks next to stone walls were allowed to grow when the property was still a field; their branches reach out about as wide as the trees are tall. With the Preserve’s numerous stone walls, the trails will give you a flavor of what Harwinton’s agricultural landscape looked like before much of it became forested. Although the trails are in very good shape now, we hope to make even more improvements over time. Volunteer help is always welcome, but most of all we hope that you and your families take the time just to visit and enjoy the sights. If you’re unsure of walking through an unfamiliar area, the Trust is planning on having a guided walk sometime in late-October (date and time to be announced).